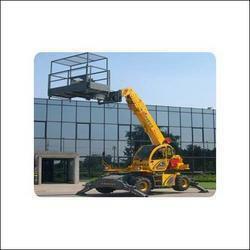 We are the service provider of Man Lifts Hydraulic Crane Rental . We are engaged in offering our customers an outstanding assortment of Man Lifts Hydraulic Crane, which is applicable in several industries. These cranes are highly efficient in carrying heavy weights and can easily lift a man. Our such Man Lifts Hydraulic Cranes have received a lot of appreciation from our clients for their capability and cost effective features. These are very easy to operate and are available in different specifications as per the requirement.